Whether it's the candles on a menorah or the needles on a cut Christmas tree, there are possible holiday hazards the Consumer Product Safety Commission and the National Institute of Standards and Technology want everyone to think about. ROCKVILLE, Md. — Whether it’s the candles on a menorah or the needles on a cut Christmas tree, there are possible holiday hazards the Consumer Product Safety Commission and the National Institute of Standards and Technology want everyone to think about. The two agencies held a vivid demonstration of why safety should figure into how consumers decorate and care for those decorations in their homes and workplaces. In a specially constructed demonstration area, two Christmas trees stood side by side. One was well watered, the other was visibly dry. Technicians lit both trees. In seconds the well-watered tree was burning, but the smoke and damage was restricted to the tree and one corner of the room. The dry tree burned much faster, with heavy black smoke filling the room, and within seconds, a wall of flame went rolling onto the ceiling in the staging area. Reporters standing behind thick glass could smell the choking smoke. 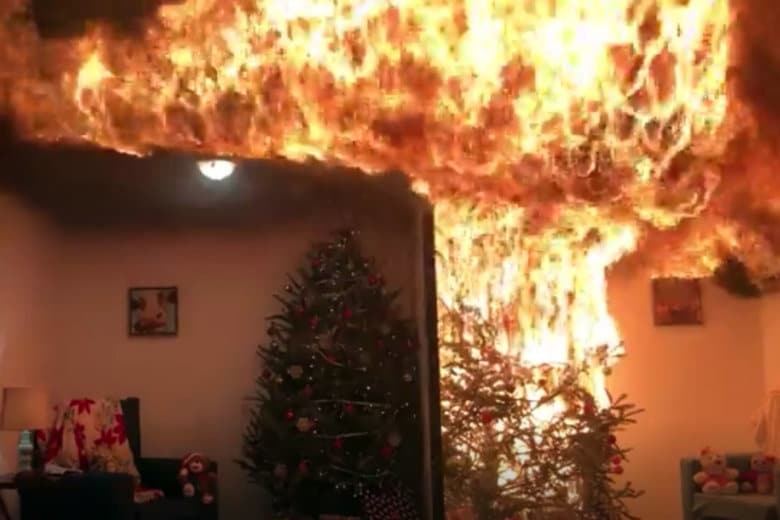 According to statistics provided by CPSC, on average 10 people died each year between 2013-2015 as the result of Christmas tree fires. And each year, there’s an average of $12 million in property damage due to fires from Christmas trees. “The loss of life, the loss of property value is totally preventable in every case,” Copan added. She also said it’s important to keep trees away from heat sources, keep it well-watered and make sure smoke detectors are in working order. Candles are a part of many holiday traditions, including the candles in menorahs at Hannukah. Buerkle recommends battery operated candles. “As lovely as candles are, they just pose a lot of safety risks, especially with pets and small children,” Buerkle said.